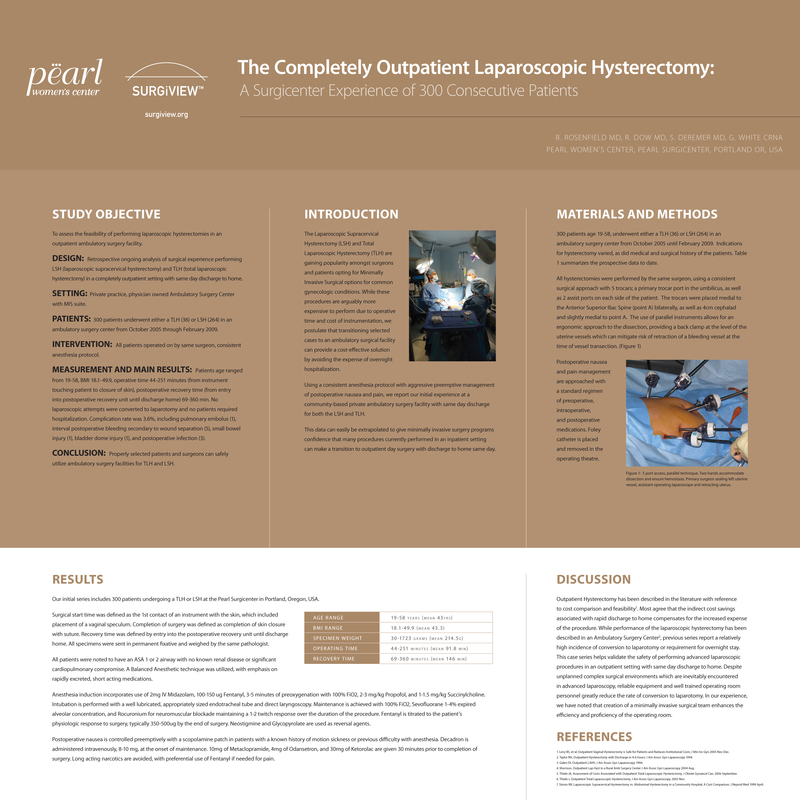 Study Objective: To Assess the feasibility of performing Laparosopic Hysterectomy in an Ambulatoy Surgery Center with Same Day Discharge to Home. Results: 250 consecutive hysterectomy patients are presented undergoing laparoscopic hysterectomy; age 19-58, BMI 18- 48.6, uterine mass 30-1800 grams, operative time36-269 minutes, time until discharge 39-360 minutes. Interventions: Operative Technique consitently utilized five access ports and radiofrequency energy for the dissection. In the Laparoscopic Supracervical Hysterectomy (LSH) , morcellation and removal of the uterus was performed through the umbilical access point. In the Total Laparoscopic Hysterectomy (TLH), the specimen was removed vaginally and colpotomy closure was performed laparoscopically. Consistent anesthesia protocols with aggessive and preemptive management of postoperative pain and nausea facilitate a pedictable and reproducible recovery pattern in patient. Concomitant operations including lysis of adhesons, enterolysis, resection of endometriosis, pelvic support surgery , and urinary incontinence slings do not alter the abiility to achieve rapid discharge to home. No complications resulted in conversion to laparotomy or transfer to hospital. Overall complication rate was 3.8%. Conclusion: The Laparoscopic Supracervical (LSH) and Total Laparoscopic Hysterectomy (TLH) can be safely and efficiently performed in a completely outpatient setting with rapid same day discharge to home within 6 hours of surgical completion. Properly selected patients and adequately trained surgeons facilitate a successful transition to the outpatient environment.